Don’t believe him about being woefully ignorant about things. I’ve read his tweets and his poems, and listened to his music. He’s very much on the ball, the kind of person that you can tell, even within the limits of a relationship involving a few 140-character notes, the guy has substance. 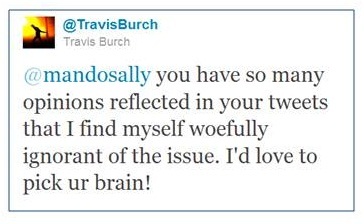 I hope to run into Travis one day, to both say hello in person and to play my mandolin with him. He can teach me a thing or twelve. merged with They Might Be Giants, “Dead”. Really. Sorry this isn’t the best video, but it’s fun. And it’s a wonderful song to memorize every word and sing often. At strange times. Like now. Finally, it all came to a culminating sing-along during the morning commute as I sang loudly to “Birdhouse in Your Soul”. I blame all of this on that crazy meme spreading around Facebook right now, the one asking you to share the song that was #1 the week you were born. Hint: None of the above are mine. This entry was posted on Friday, January 6th, 2012 at 11:27 AM and is filed under daily muse. You can follow any responses to this entry through the RSS 2.0 feed. You can leave a response, or trackback from your own site. Wow, what a combo! I forgot Nancy Sinatra was ever that young. I love that old style gogo dancing (although the exercise class interval is a tiny bit strange. Seven Year Ache by Rosanne is on my all time favorites playlist, and I just listened to it to get inspired yesterday.